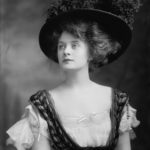 Billie Burke was an American actress who was famous on Broadway, in early silent film, and subsequently in sound film. She is best known to modern audiences as Glinda the Good Witch of the North in the movie musical The Wizard of Oz (1939), which starred Judy Garland. Burke was nominated for the Academy Award for Best Supporting Actress in 1938 for her performance as Emily Kilbourne in Merrily We Live and is also remembered for her appearances in the Topper film series. "There is no reason why marriage should necessarily compel an actress to forego her career."